I really love chocolate, really really love it. In fact I don’t know of anybody who doesn’t like chocolate, it’s just one of those foods that seems to have universal appeal. It is no wonder then that “theobroma cacao” translated as “food of the gods”, was highly prized for centuries by the Central American Mayan Indians who enjoyed a spicy beverage made from roasted cocoa beans they called chocolatl. The Aztecs gave the Spaniards their first taste of it in the 16th century who thought it to be so fabulous they took it back to Europe with them. Can you imagine what the Europeans thought upon tasting such a heavenly concoction? Most probably what I thought when I first sampled this brownie, “heck this is good”. My mother has a penchant for brownies and often asks me to make her up a batch which she keeps in her freezer, rationing out small pieces and eating them one by one with cups of strong black tea. I’ve been making brownies for some years using various gluten-free flour combinations and this one she said, is the best one yet. As a concurrent theme of this blog, many of my recipes are devised in an effort to use up produce and reduce food waste. This particular recipe was created to use up a tub of vanilla yoghurt that was right on its “best by” date. I thought the yoghurt would make a good substitute for the butter which was in the original recipe I had written some time before (and I’d run out of butter and was too lazy to go to the shops to get some). I decided to give the yoghurt a whirl and I’m so glad I did. In addition to replacing butter with yoghurt I have also fiddled with the ratios of the different flours from my original recipe and have come up with this combination for my fellow gluten-free brownie lovers. 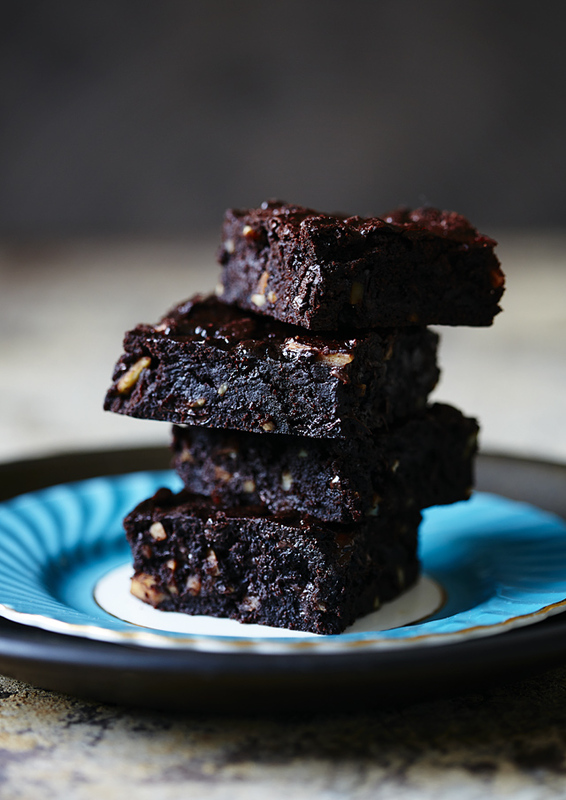 The sorghum and brown rice flours mimic the cake-y nature of wheat-flour brownies, the almond meal adds gooey moistness, the large quantity dark chocolate and Dutch cocoa powder offer the brownie that deep dark chocolate quality. Lastly, the yoghurt gives the brownie a divine fudginess. The resulting brownie is just the right amount of richness, super chocolatey and downright delectable. The Aztecs would have been proud. Makes one medium sized (30cm x 20cm/8″ x 11.5″) slice tin of brownies. Prep 20 minutes, cooking time 40 minutes. Preheat oven to 180˚C (320˚F). 1. Grease and line a slice tin with baking paper. 2. Combine the almond meal and flours in a large mixing bowl and add the remaining dry ingredients, stir through. Set aside. 3. In a separate bowl combine the eggs, yoghurt and grapeseed oil. Add the wet ingredients to the dry and stir through until combined. 4. Pour the batter into the prepared tin and bake for 40 minutes. Remove from oven and allow brownie to cool completely inside the tin. The centre of the brownie will be a little soft. It is better to undercook it so that it retains moisture (nobody likes a dry crumbly brownie), and it will set upon cooling. 5. When cool, remove from tin and cut into squares, or rectangles (or whichever shape you like). Dust with cocoa if you desire. Variation: substitute vanilla yoghurt for full fat strawberry yoghurt and fold a cup of raspberries through the batter for a divine berry and chocolate brownie. Trust me on this, I’ve done it, it’s incredible. Another image where the food simply had to be the hero and didn’t need much propping. I chose to shoot a stack of the almost-black brownies on a vintage turquoise plate with nothing more than a dark brown under-plate. Both plates were picked up at local op shops. The surface is a piece of weather-distressed masonite I pulled out of the trash and the only light used in the image is window light. They look fantastic. I should try this recipe. Maybe I will make some on halloween.